For her mixed-media paintings, Kellesimone Waits summons the specters of the past, using found photographs of strangers to cobble together the mood of a home, a culture, a decade. In her latest series, she uses colored pencil, water color and gauche to create combinations of geometric patterns and portraiture delicately arranged for a ghostly, nostalgic effect. 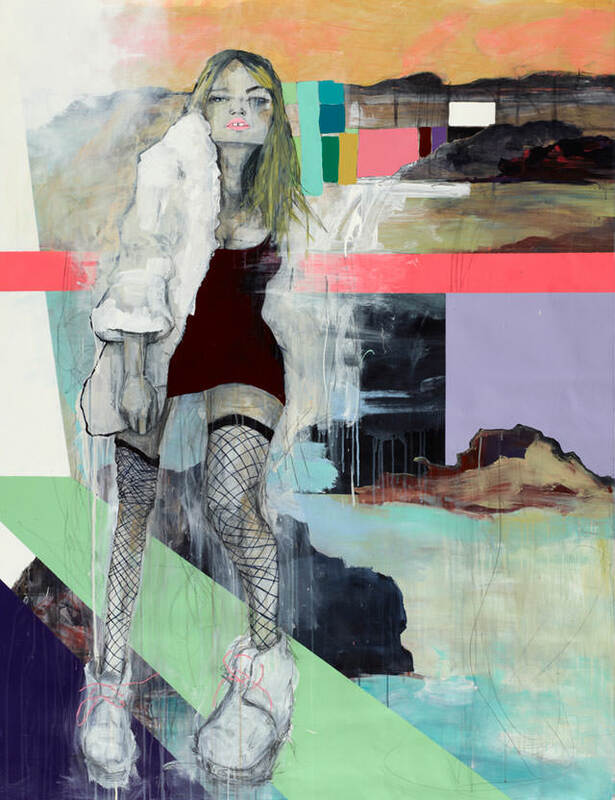 Waits (who, by the way, is the daughter of singer-songwriter Tom Waits) is due to open a show with Franklin Wiliams, her former professor at California College of the Arts at Smith Andersen North in San Anselmo, CA and a group show at 101/Exhibit in Miami June 9th. She recently took a break to sit down with me to chat with me about Catholic reliquaries, dog photos and the creative process behind her latest body of work. Is there a concept behind the new series you are working on? Yeah there’s a starting point. They’re all found photos, these are antiques and these are from this place called The Paper Pile, also in San Anselmo. This lady has everything that’s on paper, she’s basically a hoarder, so it’s an amazing experience going in there. She gives me history lessons. I’ve been collecting these for a long time. My new works are like reliquaries. A reliquary comes from Catholicism. My grandma is Irish Catholic and the relic is what goes inside the reliquary … It’s a piece of a saint. Like a finger nail or an ear or anything that they’ve touched, so their clothing. They’re these really elaborate containers … So, working with the photos — the people are gone, but now they are here with me. So I see them more as the containers. So that’s what the pieces are about. For the longest time I tried to work with them giving them new stories, but I kept getting stuck. So I came to this point that I just thought of them as beautiful objects. And that’s working out really well. So you don’t know the history of the photos? I don’t want to. Some of them have names and dates on the back but I am deliberately staying away from that information and looking at what I can actually see in the image and thinking about it as a physical object and a beautiful thing on paper. That’s why I’m making them on paper. I spend a lot of time thinking about my topic and my materials go from my topic. I wanted them to be delicate beautiful objects, and I couldn’t see that with the way I handle paint. How do you choose the mood for each painting? How does that correspond to the mood of the photograph? I spend a lot of time with each photo. I find its place on the paper and I spend a lot of time staring at the people. I’ll pull elements from what I see in the photo. The baby is the most obvious one, because you have the polka dots in the shirt so I pulled them out and put them around him. The original image is black and white but when I scanned it the printer was out of ink and did that thing where it skipped and jumped and there were all those stripes that just came in [and inspired the choice of colors.] I try to leave room for that stuff to happen. I see some sixties influence in your colors and the flower patterns. The mood of each image will pull the color in one way or another… If I spend enough time looking I can let it happen. Is that the same dog in both of those photos? And now cute animals are so abundant online. That’s actually why I hesitated to do the dogs … I was talking to the same friend and I was showing her the photos and I was saying I really love this, but I don’t just want to make dumb animal paintings because they’re all over the Internet. But then I came home and I realized I can’t let that dictate what I do. So I’m working on keeping it away from kitsch and I think it’s working out. I haven’t read comics since I was a kid but they were very much a part of my childhood. I really liked She-Hulk and then I started collecting them and I was pretty religious about that. You know, the ’90s comics … I liked the more ripped up, letting loose and out of control characters. It was where I looked to and started caring about making pictures for the first time. I wanted to learn how to make shapes like that and draw figures like that. When did you start doing art professionally? Around 2005, I had a gallery in my hometown in Santa Rosa called A Street Gallery. They’re not in business anymore, they were a non-profit. I came in to ask for a job gallery sitting and we chatted and (the owner) ended up calling me back and asking if I wanted to be in a show. Kellesimone Waits’ show “Williams | Waits” opens June 16 at Smith Andersen North and her work will be included in a group show with Alfred Steiner, Michel Modell and D. Dominick Lombardi at 101/Exhibit in Miami on June 9.